Making color and style choices can be a daunting task. People spend hours picking out the perfect colored dress, suit or even curtains for the living room. That’s why choosing the perfect vinyl siding color combinations for your home, a decision you’ll live with for years to come, can be quite intimidating. Get inspired by these vinyl siding color combinations and style ideas to highlight your home’s best features. It’s important to figure out what color scheme will best compliment your home. Light colors are great tools to use to make a small home appear larger. That can explain why large, noble estates are often painted white. You may also use light colors as a tool to create softness if your siding has hard lines. Don’t shy away from an all white home. You may be surprised to find that while color looks great, it may be best to not use any at all. A house with a white color scheme will reflect light, making the home look big and bright. Keep in mind that white homes can vary in tone throughout the day due to lighting changes so you may need to adjust accordingly. A traditional home with white siding and black shutters is one of the more timeless vinyl siding color combinations that will never go out of style. In fact, it’s the favored color for traditional, classic architecture. Keep in mind that the color you lack on your siding can be made up for with your entry door or landscaping. Have fun with the color of your door, porch furniture and plants and flowers. When choosing a light color, you’re not limited to just white. There are a number of siding color options such as off white, ivory or sand that are light in color but can still make a bold statement. Ivory and white colored sidings have a way of beautifully softening their surroundings. Dare to go bold with an accent color to make a statement against your light siding. 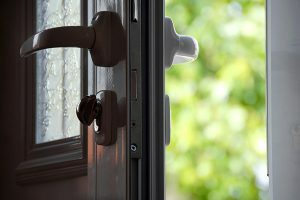 Spotlight your home’s front door with colors such as an aqua, pale yellow or olive green. These beautiful colors demand attention, adding an element of sophistication and trendiness to your exterior. Cool colored roofs such as cool grays, blacks, blues or greens generally work best with cool colored siding. Choosing a siding color based on your existing roof is often the smart decision, especially if you don’t plan on replacing your roof any time soon. 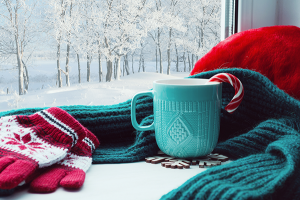 Cool colors are more relaxing and are most common in northern parts of the country. Gray is a sophisticated and timeless color, making it ideal for exteriors. Whether it’s a pale gray or a deep charcoal, gray is a color that works well regardless of seasonal changes, nature, region or architecture. 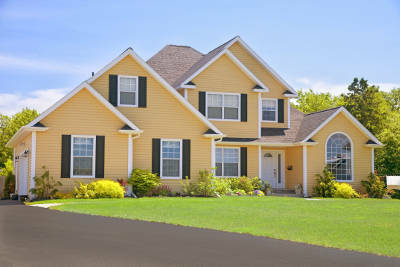 If you have a warm colored roof, consider a warm colored siding as they look best together. While contrast is good, it looks best to stay in the same color family. Warm colors, such as red, orange, beige and yellow have a way of demanding attention. They elicit excitement, and when paired with their cooler counterparts tend to appear more prominent. Homes painted yellow embody a charm that is hard to rival. Yellow is a surprisingly versatile color, working well with both quaint cottages and colonial homes. Choosing yellow comes with the risk of going too bright. The best, most practical shades are pale lemon, straw or ivory-yellow siding. The landscape around your house is loaded with color inspiration. Borrow from nature and opt to blend in your siding with the surrounding landscape. 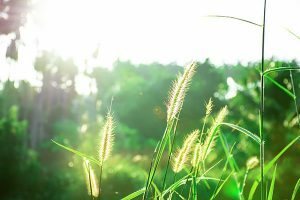 Depending on where you live, trees may give off earthy tones of green, brown and grays. A more beachy atmosphere may suggest turquoises, lively blues and corals. You can even look to the garden in your front yard for inspiring color combinations. Sage green complements many different shades of greens and makes a gorgeous backdrop for vivid flowers. This nature-inspired color looks great on homes surrounded by lush greenery and gardens. Looking for a pop of color in your vinyl siding color combinations? Pair your sage siding with an off-white trim and consider adding a red accent. Colors like putty, shades of gray, warm taupe and clay blend well with their surroundings. These colors make for a sophisticated, natural choice. Gray as an accent to a neutral colored home is simple and trendy. 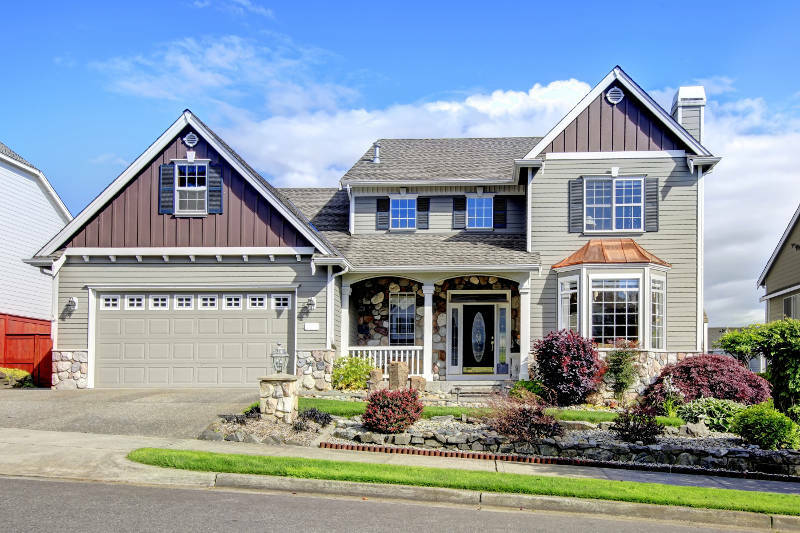 A crucial step in picking out vinyl siding color combinations is deciding whether you would like your trim to blend and fade into the color of your home or make a contrast. In addition to choosing a color scheme for your siding and trim, you should also consider accent colors for your doors, shutters, brackets, gables, columns and porch decks. If you’re happy with the current color of your home, consider changing just the trim color. 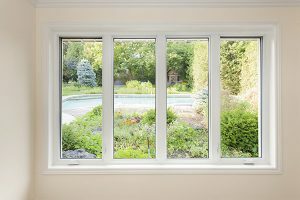 A small change such as a new trim color can make a huge difference and create an entirely new look for your home. Fascia is the trim that runs horizontally and covers the end of rafters. It’s a decorative piece that can enhance the overall look of your home and make your siding pop. Strategically coordinate your home’s fascia trim with your siding to add aesthetic and make your home stand out in your neighborhood. Fascia is almost always painted the same color as your trim. Soffit is the underside of an architectural structure such as arches, balconies or eaves. 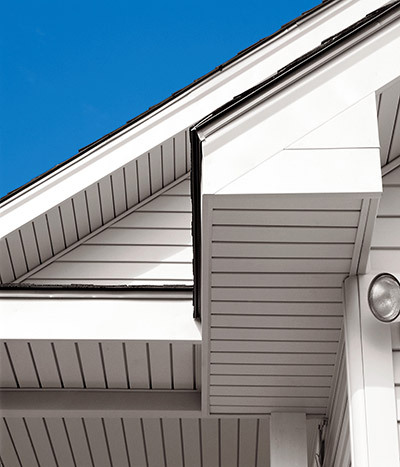 Similar to other vinyl siding styles, soffit has great ventilation and energy efficiency. Your home won’t be complete until you have picked out a proper soffit. You have a couple of options when it comes to choosing a color for your home’s trim. If you’d like your trim to blend in and fade into your home, select a color for your trim that closely matches your siding color. For a blended look choose analogous colors for your siding and trim. Analogous colors are colors next to each other on the color wheel and work well together if you would like to create a calm, tranquil color scheme. It’s best to go up or down one or two shades from the color of your siding. You may also opt to select a trim color identical to your siding color. Another option when it comes to vinyl siding color combinations is using a complementary color for you trim. Complementary colors are opposite each other on the color wheel. When used together they create a dramatic contrast, drawing attention to details. Think of an accented trim as an eyeliner for your house, creating a crisp outline. Use either white (or off white) or a dark color (black, gray, dark brown) to highlight your homes framework and architectural detail. 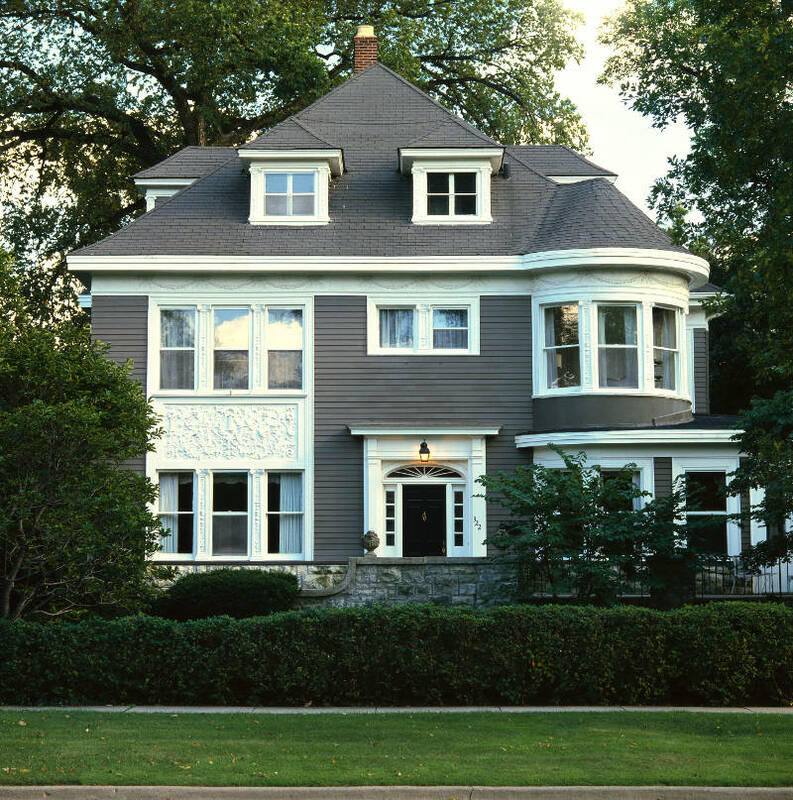 Don’t be afraid to choose more than one siding style to customize your home and add flair. Here’s a list of some unique siding style combinations sure to make your home stand out. Shake siding makes a beautiful accent, as they embody the quaint look of cedar shingles. Consider the use of different vinyl siding color combinations and use shake in either a complementary or contrasting color. Stick to no more than two or three colors for your siding. 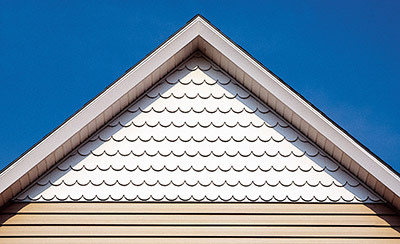 Another popular gable accent is scalloped siding. Scalloped siding has rounded bottoms that are sure to beautify your home’s look. Vertical siding is an alternative to the conventional horizontal siding. You can combine vertical siding with horizontal siding as an accent, or use it on its own. Board and batten is a type of vertical siding which has vertical boards that alternative between two widths. 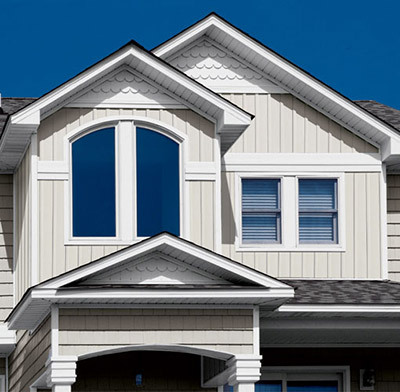 When used as an accent, vertical vinyl siding can highlight entryways, gables and windows to create a unique and modern look. Vertical vinyl siding can also be combined with stone siding, shake, dutch lap, etc. If you don’t want to completely forgo the aesthetic of stone or brick siding, these siding options make wonderful accents when combined with vinyl siding. Combinations such as stone and vertical siding, stone and shake siding or brick and lap siding are just a few siding style combinations to make your house a bit more exciting. It’s remarkable what the right color can do for your mood. Don’t settle for a home exterior that is anything less than amazing. Get started on creating an exterior color scheme and style that will make you smile every time you come home- and make your neighbors envious! Get your free vinyl siding quote here!